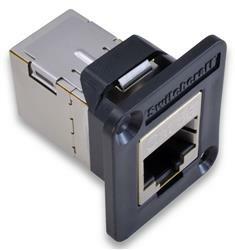 Use these panel-mount RJ45 couplers to provide convenient thru-panel access to an RJ45 cable connection. No punch-down connections are needed; simply connect existing RJ45 cables to each end of the coupler. Installation is easy; simply drill three holes in the panel to accommodate the coupler body and the mounting screws. The plastic bezel provides a neat and clean finished appearance. The coupler provides a shielded RJ45 (8P8C) connection. It is wired straight through (Pin 1 to Pin1, Pin 2 to Pin 2, etc). The MJJSGF8P8C is manufactured by Switchcraft. The data sheet is available below.